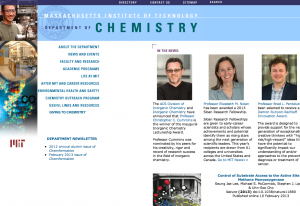 MIT is a world-leader in atmospheric chemistry research and education. It is home to a number of research groups investigating diverse areas of atmospheric composition and its impacts. We currently span five different departments on campus: Civil and Environmental Engineering (CEE), Earth, Atmospheric and Planetary Sciences (EAPS), Engineering Systems Division (ESD), Aero-Astro and Chemistry, with over 50 researchers and students. 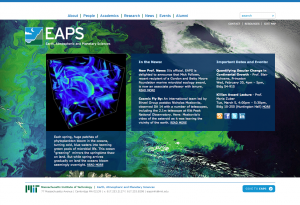 You can learn more about our faculty, research, education programs and events on this webpage. 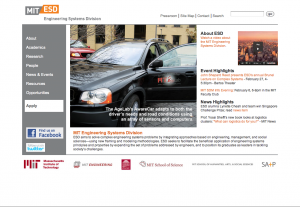 The MIT Earth System Initiative (ESI) is a contributing sponser of MIT Atmospheric Chemistry. Chemistry is truly the central science and underpins much of the efforts of scientists and engineers to improve life for humankind. MIT Chemistry is taking a leading role in discovering new chemical synthesis, catalysis, creating sustainable energy, theoretical and experimental understanding of chemistry at its most fundamental level, unraveling the biochemical complexities of natural systems, improving the environment, detecting and curing disease, developing materials new properties, and nanoscience. 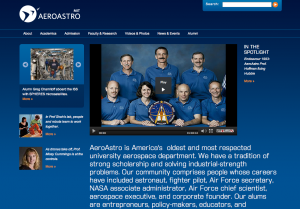 AeroAstro is America’s oldest and most respected university aerospace department. We have a tradition of strong scholarship and solving industrial-strength problems. Our community comprises people whose careers have included astronaut, fighter pilot, Air Force secretary, NASA associate administrator, Air Force chief scientist, aerospace executive, and corporate founder. Our alums are entrepreneurs, policy-makers, educators, and researchers pushing technology’s boundaries..
ESD aims to solve complex engineering systems problems by integrating approaches based on engineering, management, and social sciences—using new framing and modeling methodologies. ESD seeks to facilitate the beneficial application of engineering systems principles and properties by expanding the set of problems addressed by engineers, and to position its graduates as leaders in tackling society’s challenges. The primary mission of our department is to educate students for a future in the earth, atmospheric, and planetary sciences. Specifically, we prepare undergraduate students for advanced graduate work and for jobs in government and industry, and we prepare graduate students for careers in fundamental and applied research. 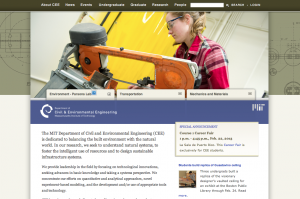 The MIT Department of Civil and Environmental Engineering (CEE) is dedicated to balancing the built environment with the natural world. In our research, we seek to understand natural systems, to foster the intelligent use of resources and to design sustainable infrastructure systems.